A blog on sweet spicy tasty food recipes. Kulfi or Qulfi is an Indian frozen diary dessert which is popular across the Indian Subcontinent . 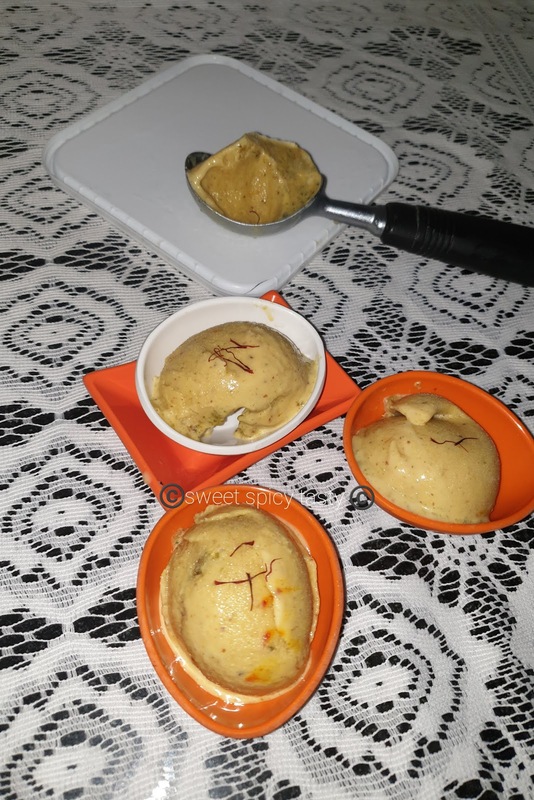 Kulfi is similar to ice cream but it is dense and creamier as there is no whipping involved in the process of preparation. The milk is reduced to a thick consistency and the necessary flavors are added to the reduced milk and then frozen . As the consistency is thick and dense ,kulfi doesn't melt as easily as an ice cream. The typical flavors are elaichi (cardamom),pista (pistachio) ,saffron (kesar/zaffran) ,almonds + pista (badam + pista) and combination of various flavors like kesar ,pista,badam ,cardamom. Today's recipe involves just 3 main ingredients and it can be made easily at the comfort of your home. There are kulfi moulds in which you can set the kulfi or it can be set in a normal container and can be scooped out and served. In a blender jar, pulse the badam, pista and elaichi into a fine powder . Donot grind it more as it will start releasing the oils from the nuts. In a thick bottomed saucepan or even a 3 litre pressure cooker , boil the milk . 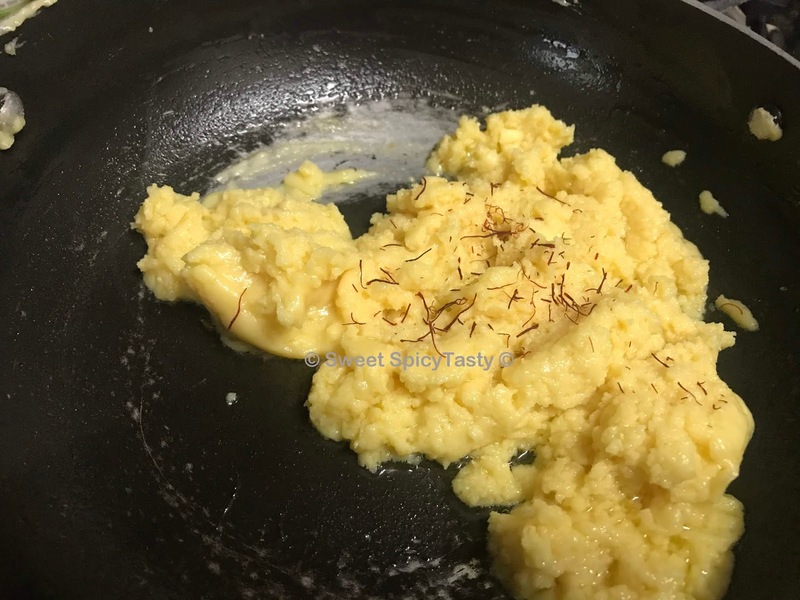 As the milk boils reduce the flame and add the saffron strands and keep cooking for 7-8 mins until the milk reduces and becomes slightly thick . Keep stirring the milk,else it will stick to the bottom and burn . 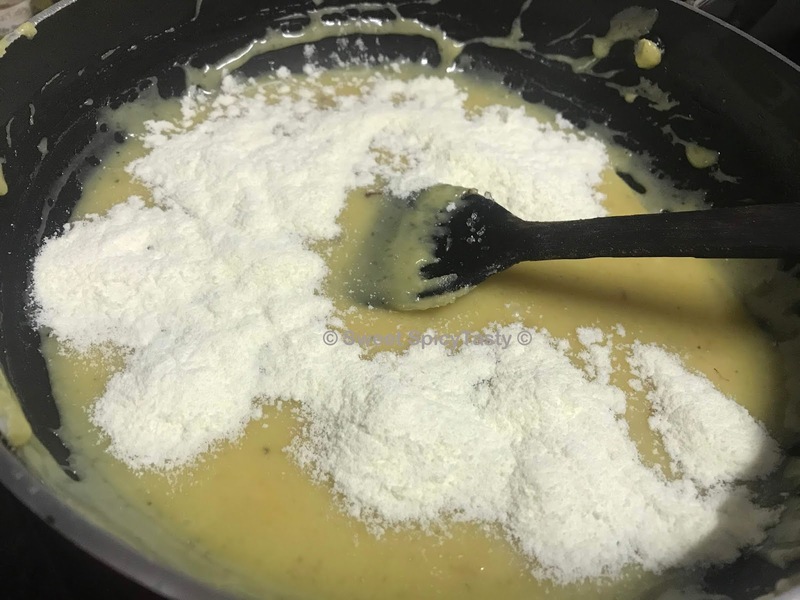 Add the powdered badam pista , quickly stir it so that the lumps are not formed and if you see any lumps, break them using the back of a ladle. Turn off the stove and completely cool the mixture till it reaches to room temperature . If setting in a container, make sure you put a cling film cover before you can close the lid. This will prevent crystallization of ice . While the mixture is boiling ,keep scraping the milk that solidifies or sticks to the sides of the pan . This will ensure the mixture doesn't burn and it becomes easy to clean the pan later. 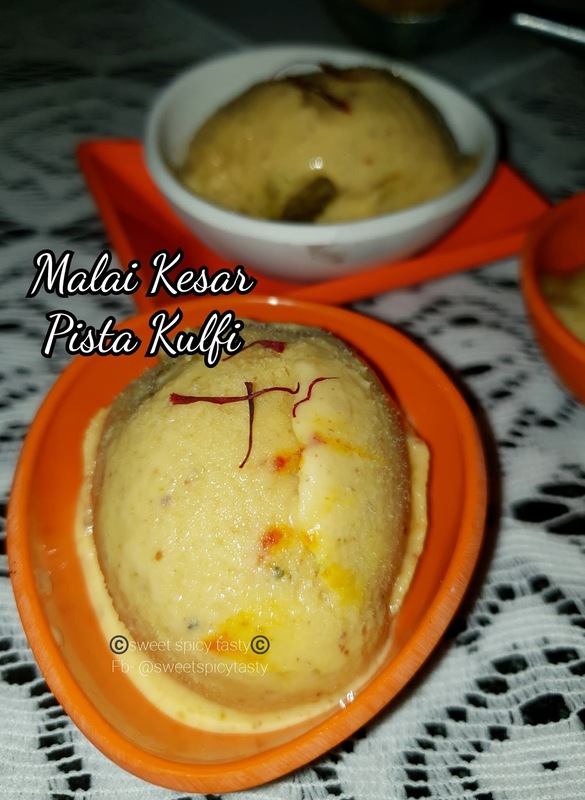 Remove the kulfi container or mould and keep it in the refrigerator compartment about 5-10 mins before serving .This will make it easy to demould or scoop . 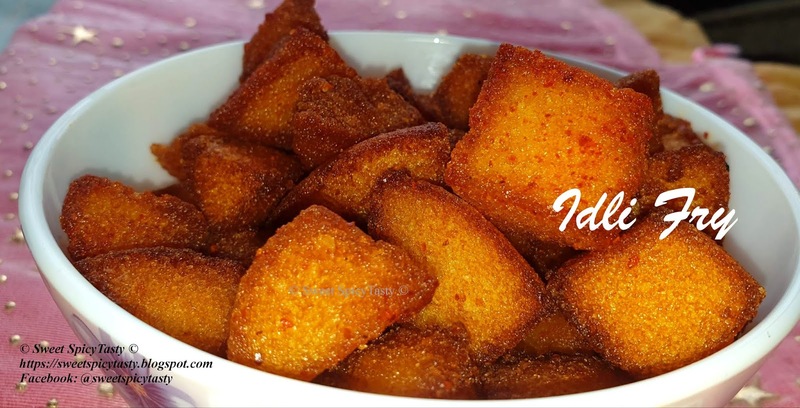 Idli fry is a yummy finger food that is made using left over idlis. Idlis generally tend to get a little dry and hard if they are left over night or for a few hrs after making and no one would want to have it as it loses it freshness. This can be served as an evening snack for kids with their milk or even as starters at any party or pot luck get together. Serve it as is with some chat masala sprinkled over it or you can also have the green chutney and tomato sauce as dip . Heat the oil well and deep fry the idli cubes in small batches . Donot over crowd the kadai/ wok and fry in medium flame. Fry until they turn crisp and golden brown. Sprinkle some chat masala and red chilli powder as per your taste and toss it well such the spice powders coat the idli fry nicely. Serve it with a dip if you like or eat it as is and enjoy the crunchy idli fry . Note : If you want to prepare this idli fry as a starter for an evening party, prepare the idlis in the morning and keep them ready . By evening the idlis would have become slightly dry and it will be easy to prepare the snack . Fresh idlis will absorb too much oil and the taste & texture of the snack will be spoilt . You can refer to my video below for the recipe of how to grind Idli Batter in a Wet Grinder. We wish people to always be in the PINK OF HEALTH ; and this vegetable beetroot is just true to this phrase . Beetroot is a powerhouse of nutrients and many vitamins . It is known to be a natural remedy to fight anemia and iron deficiency . Raw beetroot juice is used for detox and cleansing of the liver . Cooked beetroots are rich in fibre which is also very essential for the body . As the beetroots when eaten raw have an earthy smell many people do not like to eat it raw , especially children..so as I say sneak them into parathas and feed them so that they will eat . My blog has many recipes for delicious parathas which are kids as well as adult friendly. You may check the recipes below. Grate the beetroots using a grater . Mix the grated beetroot, green chillies , corriander, carom and sesame seeds well with your fingers such that the flavors are released well. Now add the wheat flour, salt and knead a soft pliable dough. Keep covered and let it rest for 10 mins. Tip : Donot add too much water in the beginning. The juice from grated beetroot is enough to help in kneading the dough. Incase you need extra, just sprinkle as and when you need. Pinch out medium sized balls from the dough,, dust them with flour and keep ready. Roll out into a medium thick paratha using the rolling pin on a clean and hard surface. Heat a tawa / griddle and roast the parathas evenly on both sides by smearing about 1 tsp oil . Serve hot with dal , thick curd/yogurt and some pickles. You can also check for other Roti/Parathas featured in this blog. 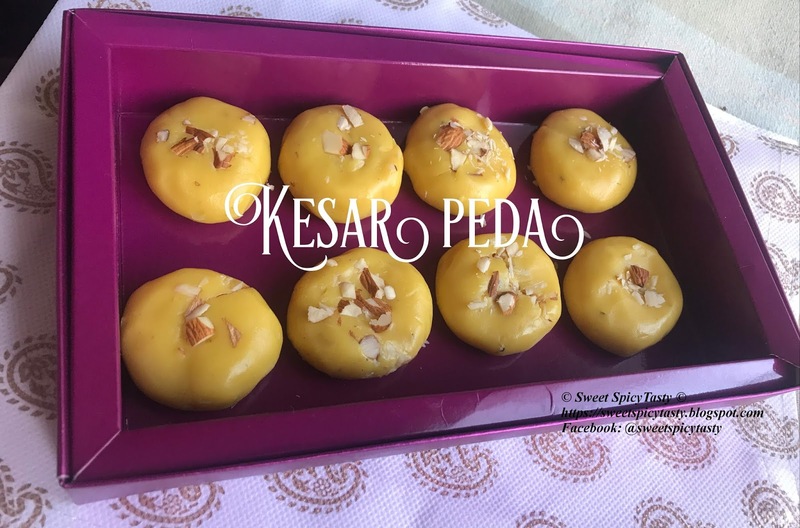 Peda is a traditional Indian sweet made using milk ,sugar and other flavoring agents like saffron, cardamom, pistachio etc. Traditionally milk is boiled in huge vessels and condensed to form a nice thick mass with added sugar and flavor of our choice and is then rolled out as balls and allowed to set. 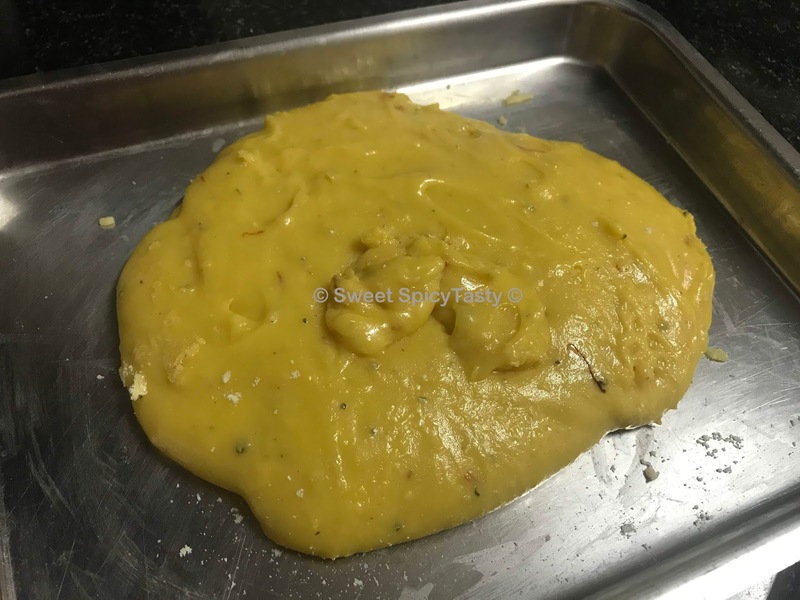 Today we shall see a quicker version of making peda using khoya / mava and can be prepared in less than 20 mins with a natural flavor of saffron / kesar. There is no compromise on taste as well as texture and it is a melt in mouth recipe . 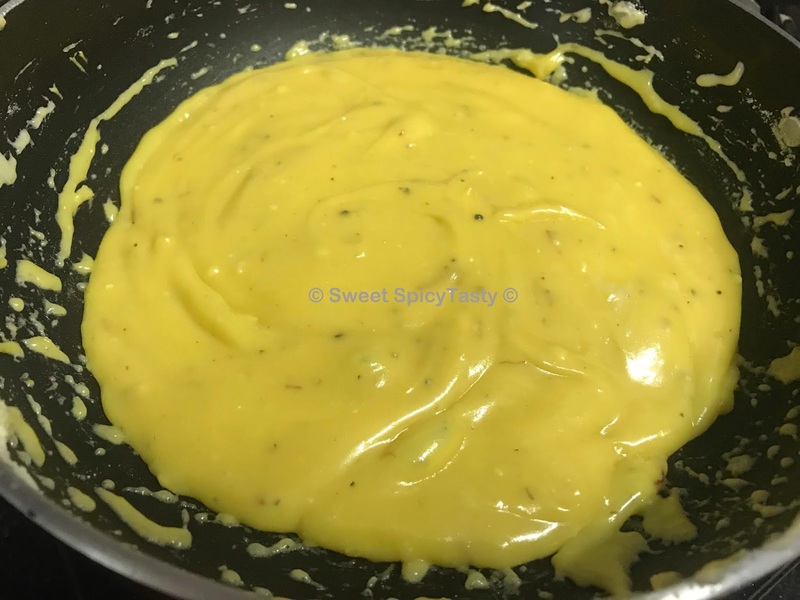 In a thick bottomed pan, heat the ghee and add in the grated khoa and turn on the flame to medium. Keep sauteing it such that it does not burn and stick to the bottom of the pan. Slowly, the khoa begins to melt and forms a nice mass . Stir it and break all the lumps. We need a smooth mixture. Add the saffron strands at this stage and mix it well. This will enable the essence and flavor of saffron to penetrate well into the khoa. Add sugar and mix , the mixture will become runny as the sugar melts. Do not panic and keep stirring very carefully. Add the cardamom powder and continue cooking till the mixture begins to thicken . 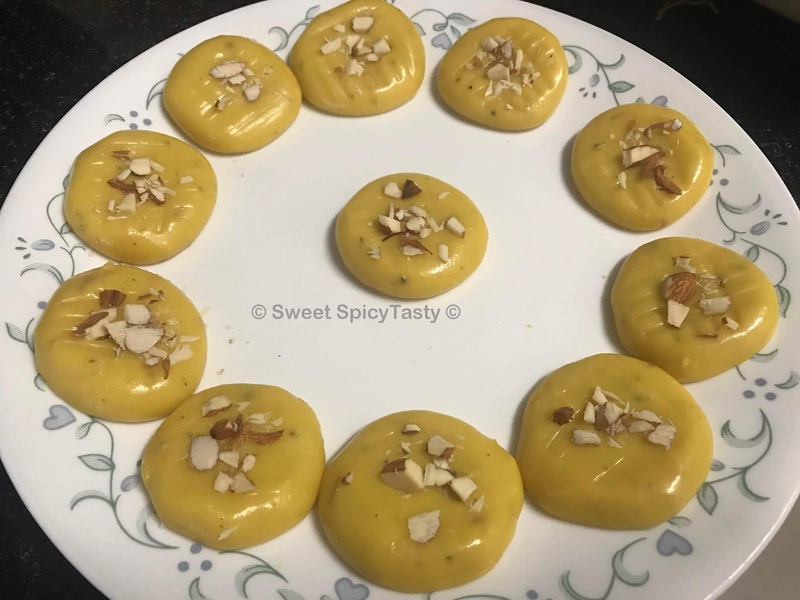 Before adding the milk powder, reduce the flame to minimum as adding the milk powder will help in thickening the peda mixture and there is every chance of burning . Once the flame is reduced to minimum,add the milk powder and quickly mix it and cook further. When the peda mix is properly cooked it will appear glossy and you can see that it forms a nice mass and has left the sides of the pan i.e. now the mixture will not stick to the vessel and won't be greasy. Clean the sides of the pan by nicely scraping out all the khoya that must be sticking due to the continuous stirring . Slowly pour the mix on to a nice greased plate and let it cool for about 10-12 mins. Once it has cooled down, knead it well with your hands to form a soft and smooth dough. Pinch out small balls, roll it out smoothly and flatten it with your palm and decorate it with chopped nuts. Allow the pedas to cool and set before you can savor it and enjoy the melt in mouth pedas. You can make impression on the pedas using a fork or any design press if you have. Panchaamritha literally translates to Pancha ( 5 in sanskrit) and Amritha ( Nectar in sanskrit). Panchamritha is a concoction of 5 ingredients mainly ghee (clarified butter, jaggery,honey, banana and bananas) . This concoction is offered to the lord and is always one of the main offerings made during any holy occasion or pooja like Satyanarayan Pooja, Ganapathi Havan/Homam etc. There is a milk difference in the Panchamritha served in Northern India and Southern India. 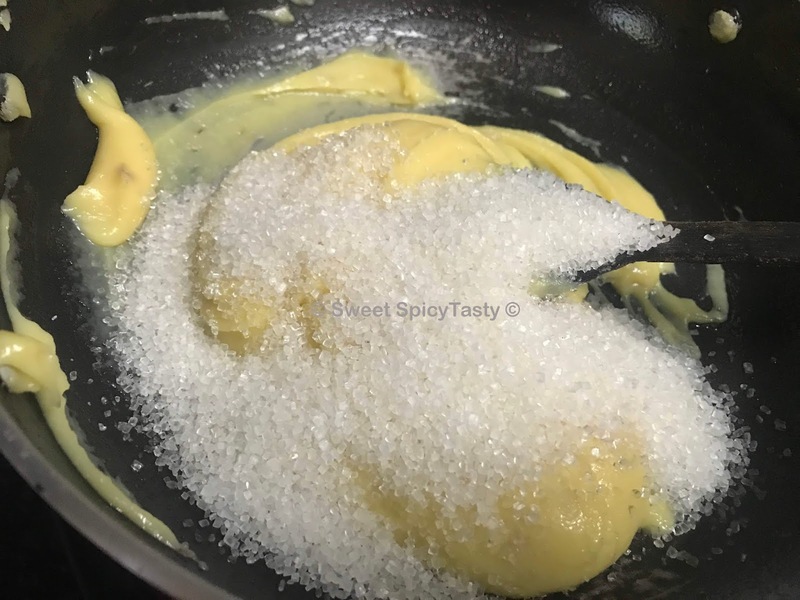 The one that is offered in North India is slightly liquid in consistency and has more of milk and yogurt along with honey,ghee and some bananas . 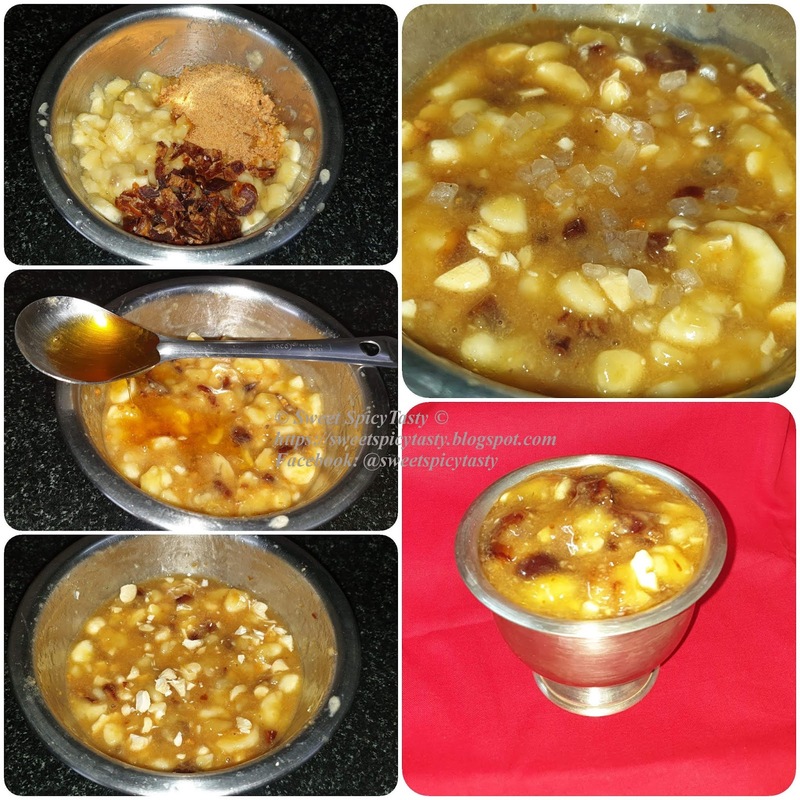 The Panchamritham offered in South India , is more like a Jam in consistency and has lots of banana, jaggery,honey, some pitted dates / cashews, ghee and rock candy/ diamond sugar . A pinch of cardamom is added for extra flavor which is purely optional. Some places we can see addition of pomegranate pearls , apple slices also , but all that is purely optional. In South India , Palani - one of the abodes of Lord Muruga / Karthikeya is known for its Panchamritham being offered as prasadam to all devotees. It is called as Palani Panchamritham . Panchamritham is one of the main neivedhiyams/ prasad for Ganapathy Homam or any pooja related to Lord Karthikeya. Today, I am going to explain the recipe for making the South Indian Style Panchamritham. In a wide mixing bowl, roughly chop the bananas and slightly mash them using a masher or the back of a spoon. Add the honey, jaggery, ghee , dates and cashews and mix it well with a spoon. The consistency to appear like that of Jam. Add in the cardamom powder and mix it. Lastly add the diamond sugar and lightly mix it. The crunch of the diamond sugar while eating the panchamrit is very tasty ,hence it is to be added in the end. 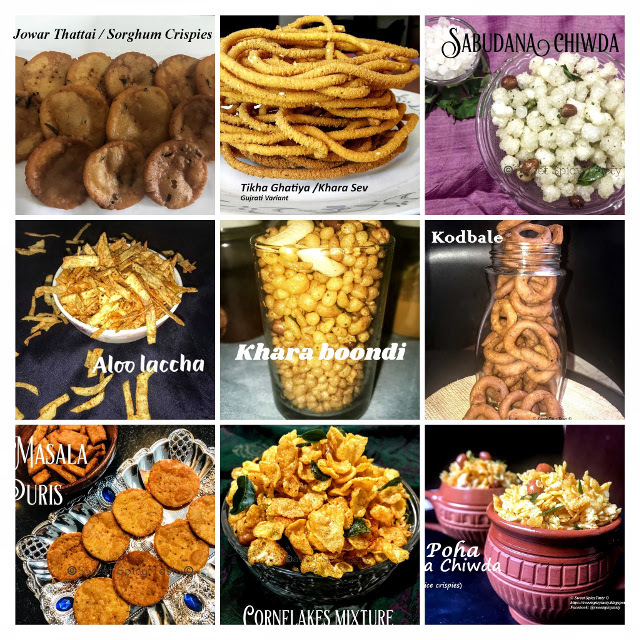 Happy & Safe DiwaliHi friends, Diwali is just round the corner and here is a handy collection of Savories that you would want to enjoy with family,friends & relatives. These recipes are not very complicated and can be prepared in less than 30 mins. Note : The quantity mentioned in the recipes is for 2-3 people. You can proportionately increase the quantity of ingredients if making in bulk. Capsicum Paneer paratha is a very nutritious and healthy breakfast option loaded with the goodness of capsicums/ bell peppers and cottage cheese i.e paneer. This can be even packed for lunch box for kids as well as adults. The addition of paneer provides the necessary protein requirement for the day making it a wholesome meal . Serve it with some thick curd / raith or some pickle .Can also be paired it with some gravy or dhall if serving for lunch or dinner. In a wide mixing bowl,add the capsicum,paneer,corriander,green chillies, chilli powder,turmeric,salt,chat masala and mix them well such the flavors are released well . Add the whole wheat flour and knead into a soft pliable dough by using water little by little. The paneer and capsicums would have also released some water into the mixture ,so add water cautiously.Else you will end up with a very soggy and soft dough making it difficult to roll. 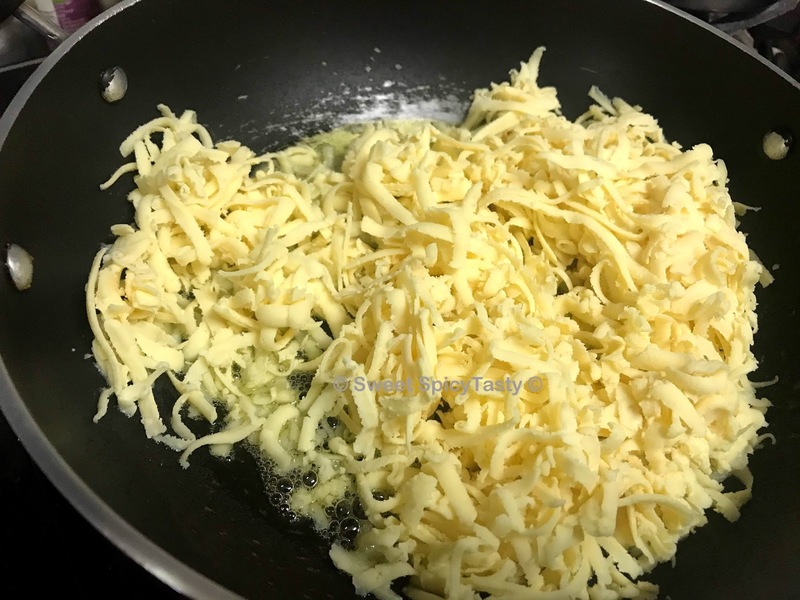 Pinch out medium sized balls and roll them out into medium sized thick rotis and roast it on a heated tawa using oil or ghee . Serve hot with a gravy of your choice or some curd and salted butter is also an amazing combination. Vazhakkai Puli Kootu is a delicious and a nice alternative to the regular raw banana curry / vazhakkai curry or vazhakkai podimaas . This recipe belongs to the South Indian cuisine and more so is a very traditional recipe of the Tamil Brahmins. Mostly this recipe features on the menu of the wedding meal . This puli kootu can be served with some piping hot rice with a dollop of ghee and some papads as side or can also be served as an accompaniment to any vethakuzhambu variety or sambar or even More kuzhambu. Roast the udad dhall and dry chillies in a tsp oil until the dhall turns golden brown and crisp. In the same pan roast the coconut also until it turns light brown and gives a nice aroma. Cool the ingredients and grind it into a fine paste and keep aside. 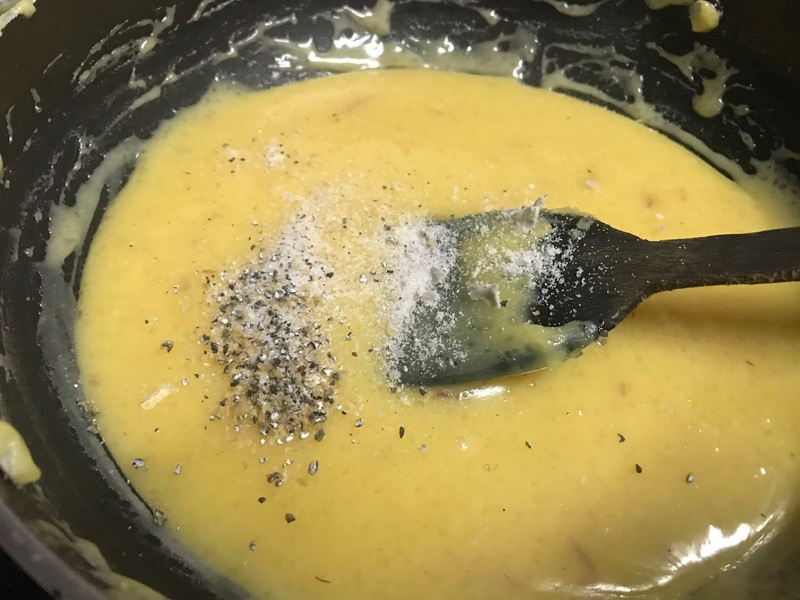 Add the boiled thoor dhall/ thuvaram paruppu ,adjust salt if required and when it reaches to a rolling boil stage,add in the coconut paste,about 1/4 cup water and cook for 3-4 mins.Turn off the stove,prepare a tempering of mustard seeds,curry leaves and asafoetida and add it to the kootu. Palak Paneer absolutely needs no introduction. A very very healthy and nutritious recipe with the loaded health benefits of Palak/ Spinach and Paneer. By now as all of you must be aware ,I concentrate on presenting recipes as No Onion No garlic versions, so for this Palak Paneer recipe ,I have used cashew paste to add to the richness of the gravy and also a mild nutty and sweet flavor. Clean the palak well to remove any weeds or rotten leaves and then wash under running water multiple times to remove off all the mud and other dirt. You can refer to this video to know how to clean any green leafy vegetable thoroughly. If the stem is tender, you can use it along with the stems or separate the stems from the leaves. Once cooled,put the spinach in a blender along with some chopped ginger and make a fine puree out of it and keep aside. Make a fine paste of the soak cashews in a blender and keep it ready. In a pan/ kadai heat some oil and lightly fry the paneer cubes until they turn light brown. Do not over fry them as it will become tough and rubbery. Drain the paneer cubes and keep aside. In the same pan, splutter some cumin seeds and saute some green chillies . Add the cashew paste and quickly stir by adding a little water as it will stick to the pan and chances of getting burnt are more . 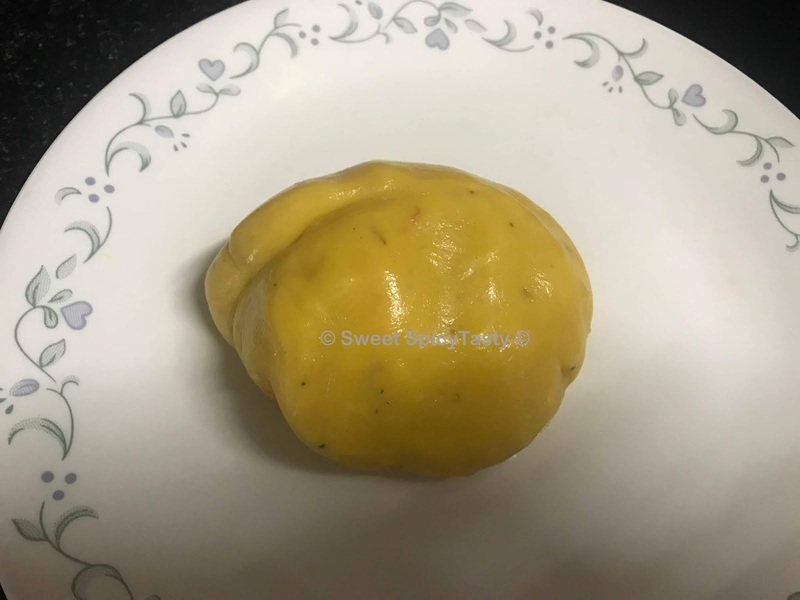 Once the raw smell of the cashew paste is gone,add some haldi and garam masala and cook it for 1-2 mins so that the masala and the cashew paste blend well. Now , add the palak puree ,mix well and add 1/2 cup water. Adjust the salt if needed and let the mixture cook well for 3-4 mins. Once you see small bubbles in the gravy,add the paneer cubes , mix well and let it cook for 2-3 mins so that the paneer becomes soft and absorbs the flavor of the gravy . Turn off the stove, let it rest for a few mins before serving. Serve hot with any kind of rotis, naan, parathas of even with some jeera rice or plain steamed rice. Lemon Capsicum rice is a very filling and can be prepared in a jiffy. This also is a good option for lunch box as well. Addition of some groundnuts and boiled chick peas (kabuli channa) enhances the flavor by giving the necessary crunch and also the nutrition value increases because of the protein value . Does not require any separate accompaniment , some chips or fried vadams/ papads will go well and kids will definitely enjoy this. A hassle free preparation for working ladies with a slight twist to the regular lemon rice / nimbekkai chithranna. In a pan, heat the oil fry the groundnuts first followed by the seasoning mustard, channa dhall, udad dhall, green chillies and curry leaves. Once the dhalls have turned light brown add in the asafoetida and turmeric. Toss in the boiled chick peas, chopped capsicum with required amount of salt and let it cook until the capsicum gets a little tender. Turn off the stove and let it cool . After it cools down add the lemon juice and mix well. Add the cooked rice to the capsicum seasoning and carefully mix it such that the rice grains do not break . Take care not to mix continuously . Adjust some salt if you need , sprinkle the sugar and mix well. Garnish with fresh corriander and serve with some chilled curd and papads/ fryums of your choice.